The problem with writing blog posts at this time of year is that there’s so much to write about. By the time I photograph a flower and research it and publish the piece, it may very well be done for the year. 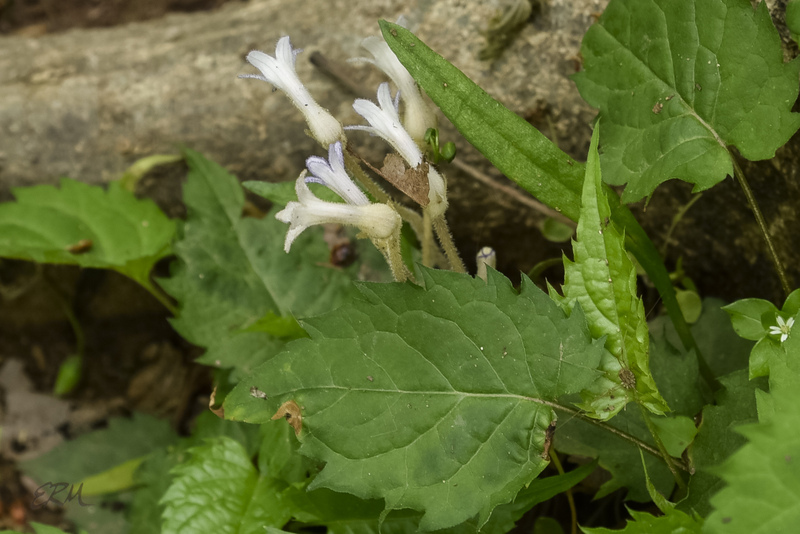 That’s probably the case with these two species, which I group together because they bloom at about the same time, and because the only place I know where to find them is about a five-minute walk from my house. 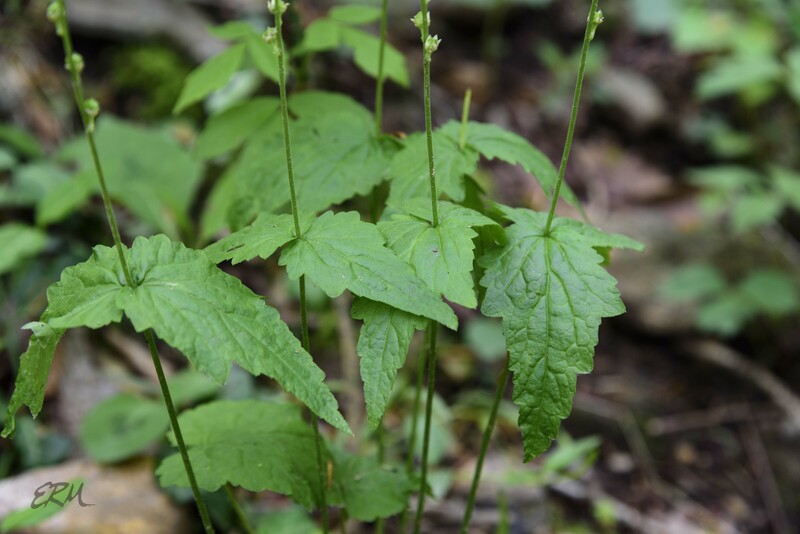 Two-leaf miterwort, also called bishop’s cap, (Mitella diphylla, Saxifragaceae) is a perennial clump-forming forb that stands about two feet tall. It’s a simple plant, with a basal rosette and one pair of leaves on the flowering stem (hence the specific epithet). 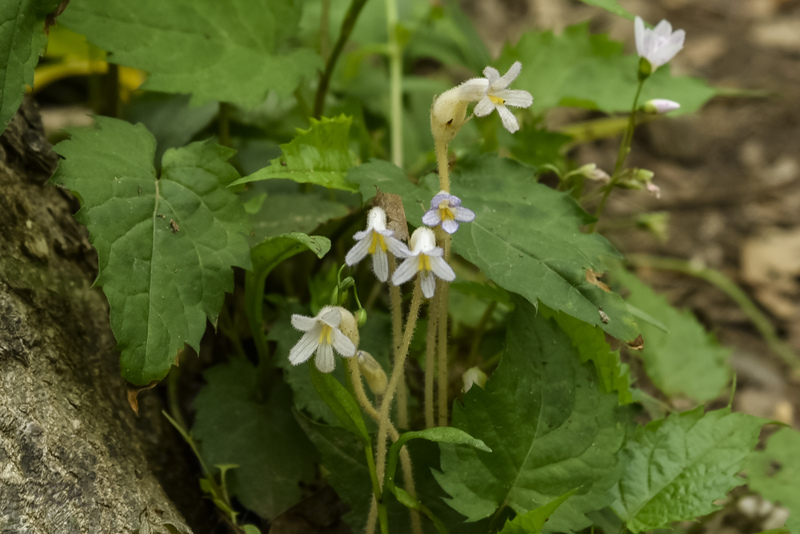 The individual flowers on the raceme look like tiny snowflakes. The whole plant is so wispy that it’s easily passed by. 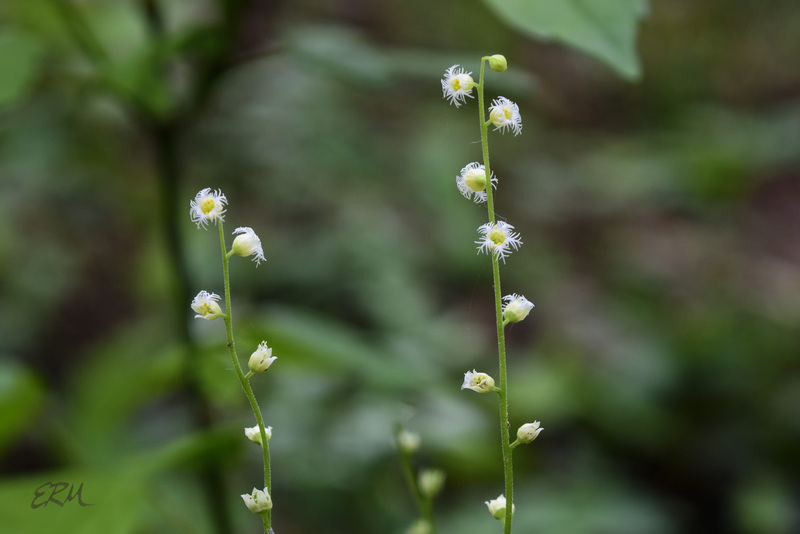 There are five species of Mitella native to North America, but this is the only one found in the mid-Atlantic. It’s also found in the Appalachian South, the Midwest, and New England. 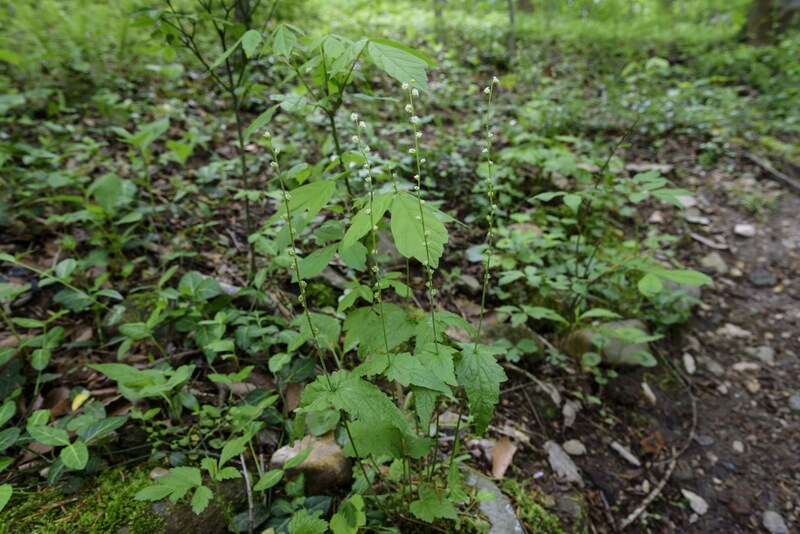 In Maryland it grows from the western coastal plain west to the Appalachian plateau. 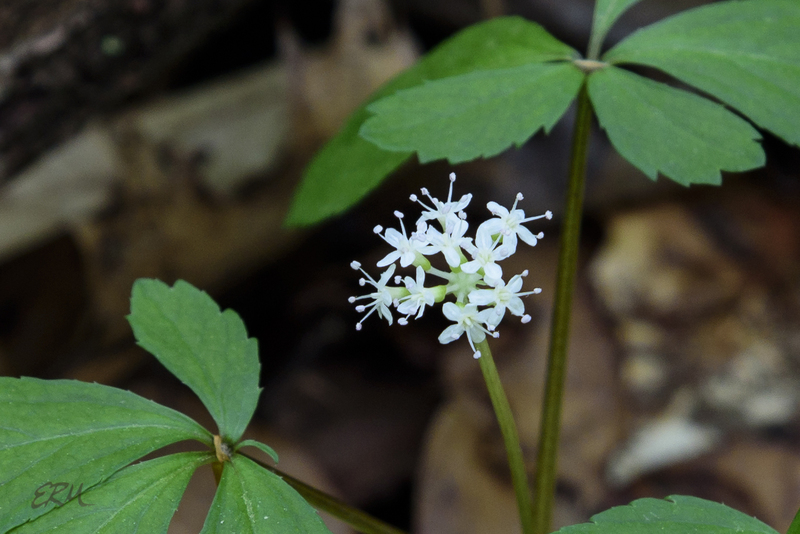 A much shorter plant, also easily overlooked, Panax trifolius (Araliaceae) is somewhat misleadingly named: the leaves often have five leaflets, though two of them are quite small. 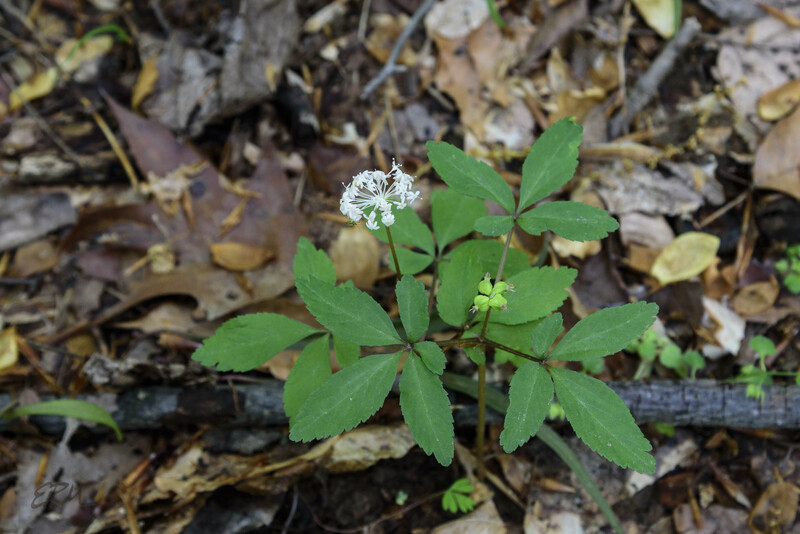 Dwarf ginseng is not the ginseng of commerce: that’s Panax quinquefolius, which also has five leaflets, but the leaflets have short stalks (petiolules), which is one way to tell the plants apart. The other leaves in yesterday’s photo of great yellow woodsorrel belong to another five-petalled, yellow-flowering species, Potentilla canadensis (dwarf cinquefoil). This is a low-growing vine in the Rosaceae. 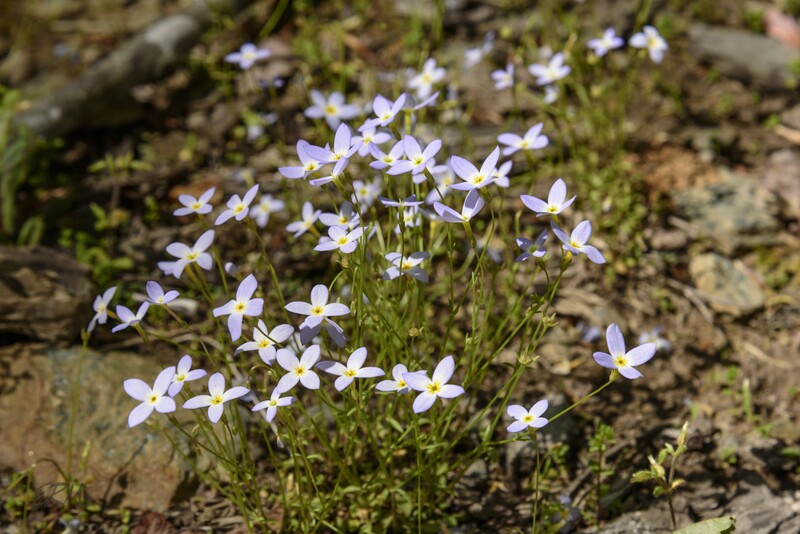 It favors drier, rocky soils, like wild pinks and bluets do, and can be found growing near them in the Carderock area. This is a good example of a rosaceous flower. The five distinct petals with the sepals peeping out between them are typical of the rose family. The leaf is atypical, being palmately compound with five lobes, but somehow it still looks characteristically rose-like to me, maybe because of the toothed margins. 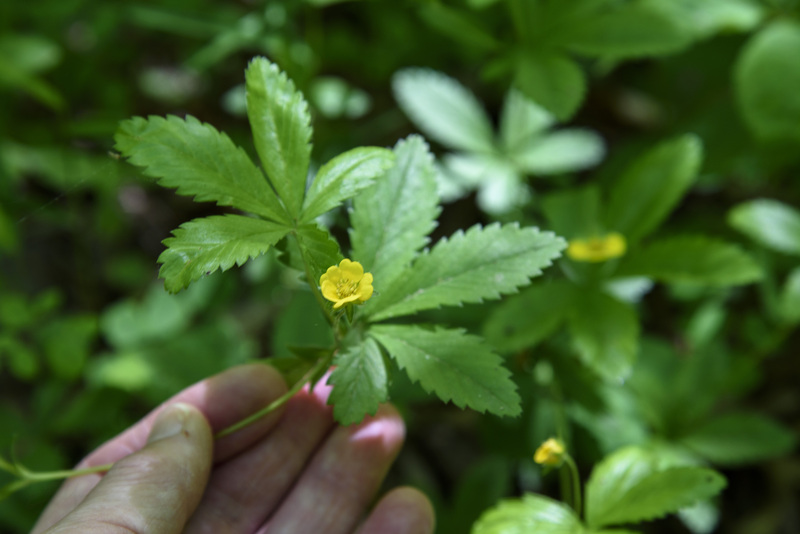 Dwarf cinquefoil is found in much of the eastern US, especially from South Carolina to New Hampshire and the eastern parts of Ohio, Kentucky, and Tennessee. Another look-alike is in the same family but a different genus… for now. 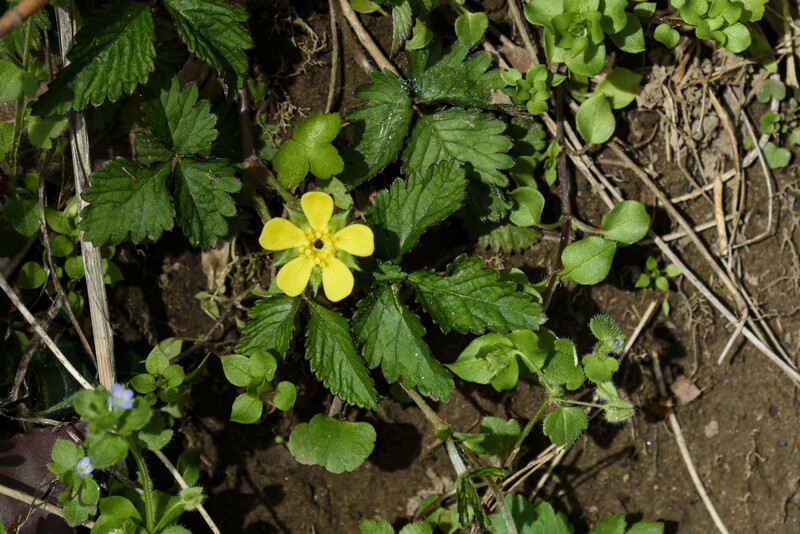 Recent research suggests that Duchesnea indica, false or mock strawberry, should be considered a Potentilla*. 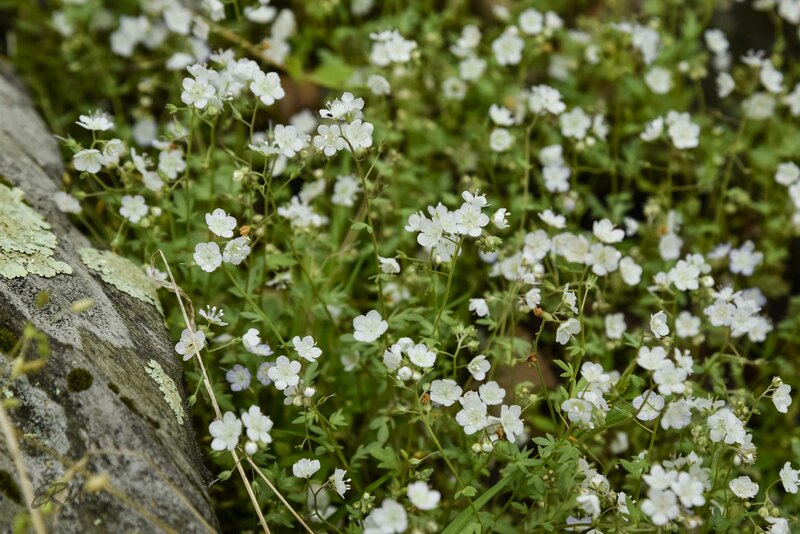 A very common lawn and garden weed, and a weed of natural areas as well, it produces fruit that isn’t edible. Well, technically it is edible- it’s not poisonous – but the strawberry-like fruits are flavorless. 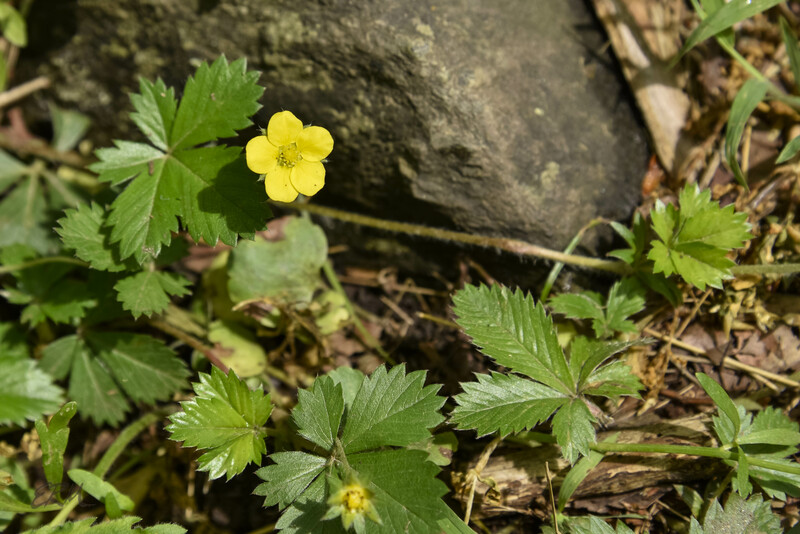 These pictures show an obvious difference between the Potentillas and Duchesnea: the former have five leaflets (hence the common name cinquefoil), while the latter have three leaflets. 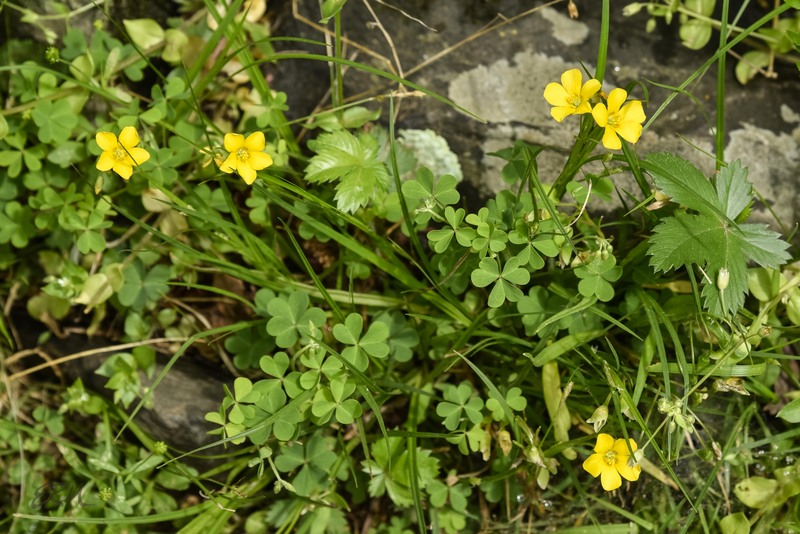 Reviled by gardeners, yellow woodsorrel seems to show up everywhere. I’m not sure I’ve ever purchased a gallon-size or larger plant of any sort from a nursery that didn’t have the darned thing tagging along. 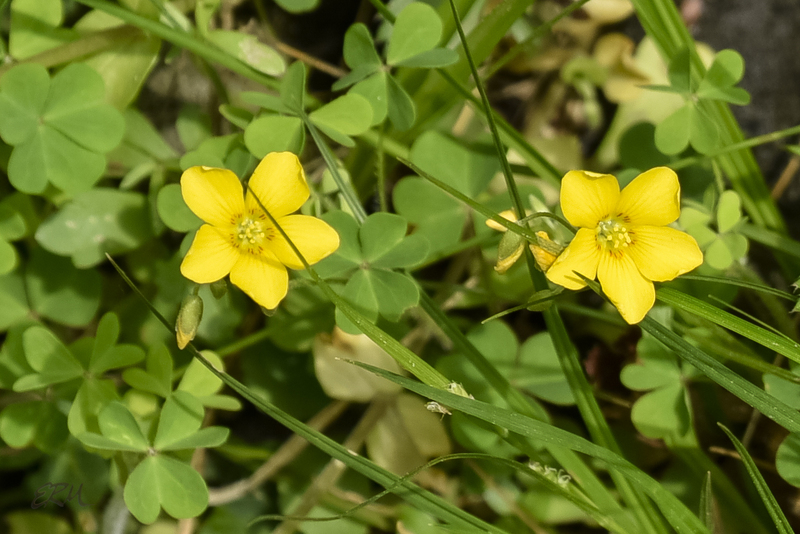 I’ve never bothered to key out a sample (maybe I will soon, when it isn’t raining; it won’t be hard to find), but the little plants that some people mistake for some sort of yellow clover are likely Oxalis stricta or O. corniculata, both of which are listed as weedy or invasive by several authorities. Oxalis species have leaves that resemble clover’s, with three heart-shaped leaflets, but clover is in the Fabaceae while Oxalis is in its own family, Oxalidaceae. But this post isn’t about the weeds. It’s about two other woodsorrels, both with lovely flowers. Both form colonies from runners along the ground, but they aren’t weedy. If I found these in my garden, I wouldn’t pull them out. 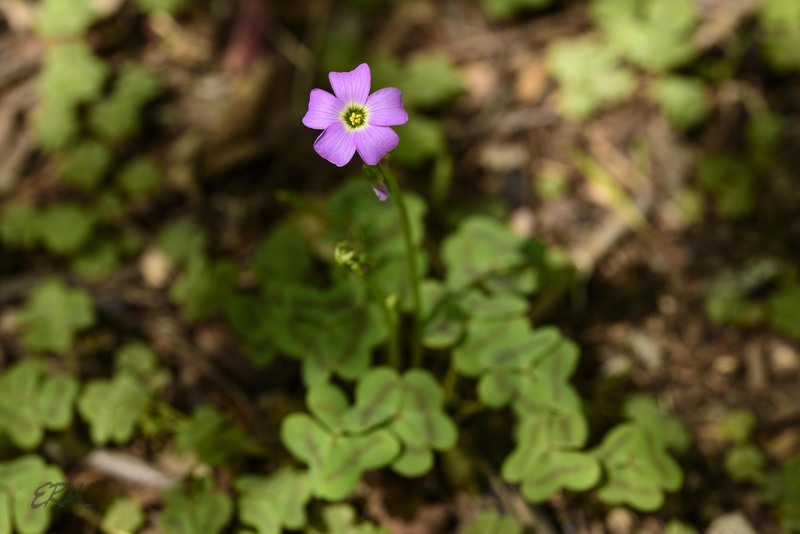 The purple flower photobombing the first picture in yesterday’s post is Oxalis violacea, violet woodsorrel. 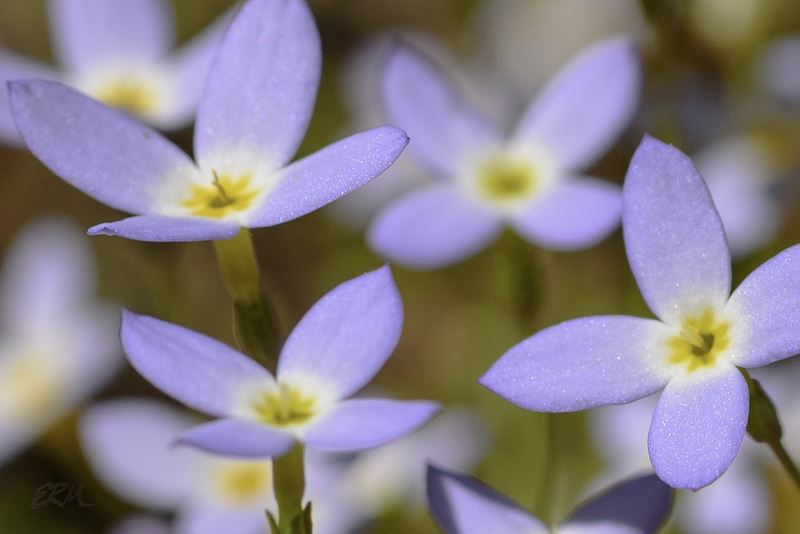 It’s a perennial forb found from the Great Plains east to the Atlantic, as far north as Vermont and south into Florida. It’s listed as endangered in Massachusetts and Rhode Island, threatened in Michigan and New York, and special concern in Connecticut. 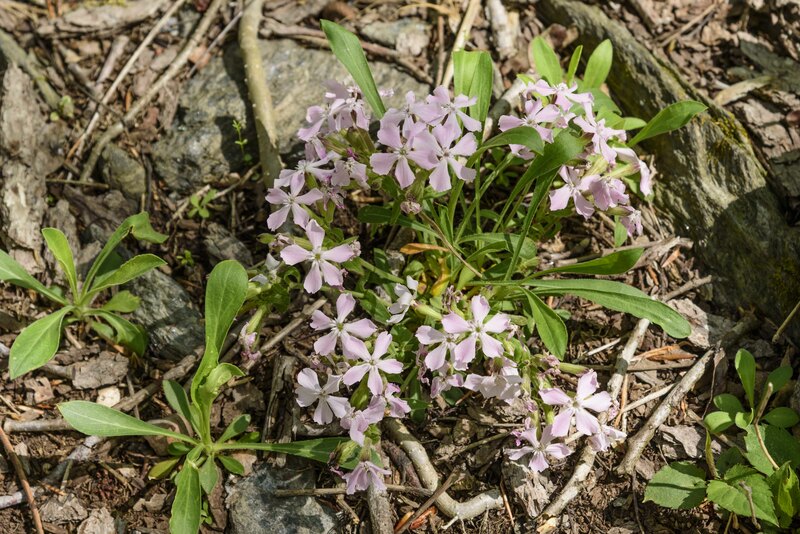 The leaves are typical for this genus except for the purple markings, which may be very faint but at this time of year are usually quite distinct. Like many oxalis species, the leaflets fold together when there is little light (including overcast days). 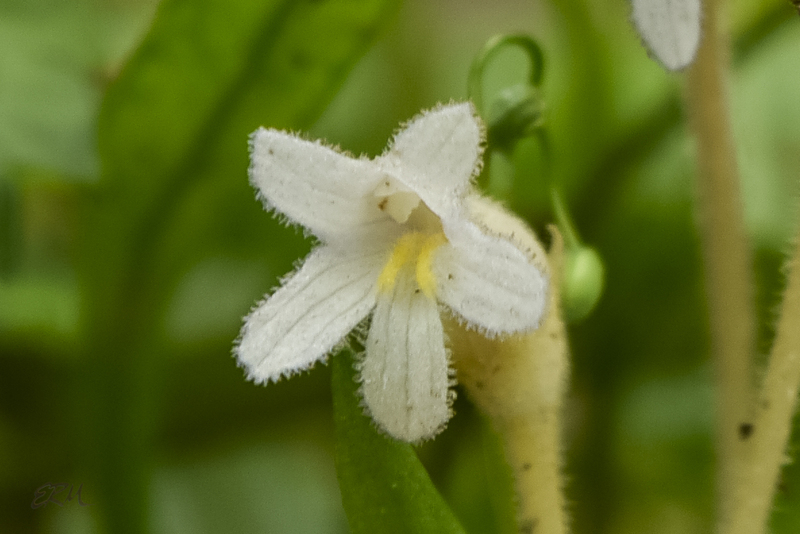 The flowers are about half an inch wide. 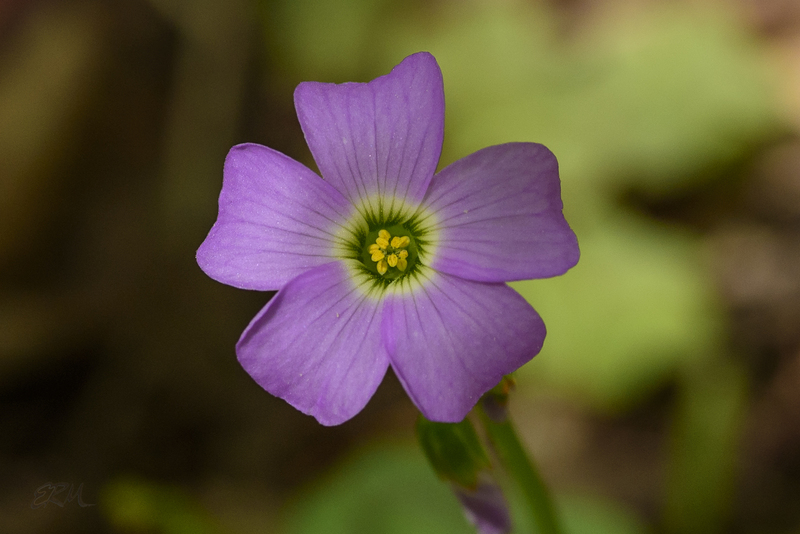 The flowers of the other species, Oxalis grandis (great wood sorrel), can get even larger, up to an inch across. Note the orange-red markings in the throat (click on the picture for a larger view). 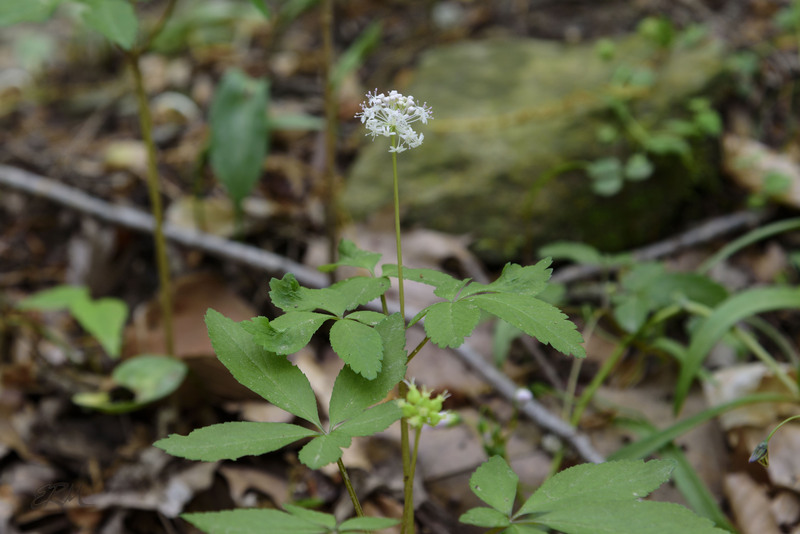 There are several species with this characteristic, but none of them are found in Maryland, making this an easy plant to identify when found here. This species is somewhat more upright than other Oxalis species. 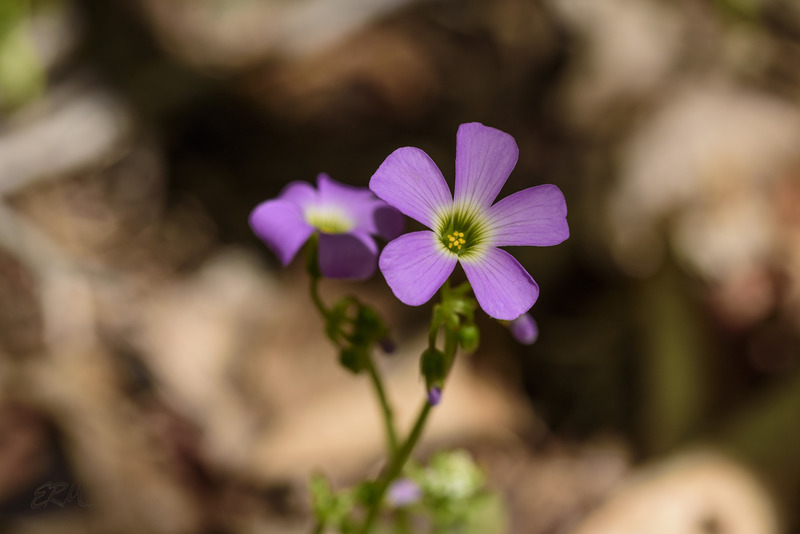 Great yellow woodsorrel has a much smaller range than violet woodsorrel: it’s found from Pennsylvania south to Alabama and west to the Mississippi River. See the larger, deeply lobed and serrated leaves in this picture? They belong to a different yellow flower. More on that, and a closely related alien, next time. 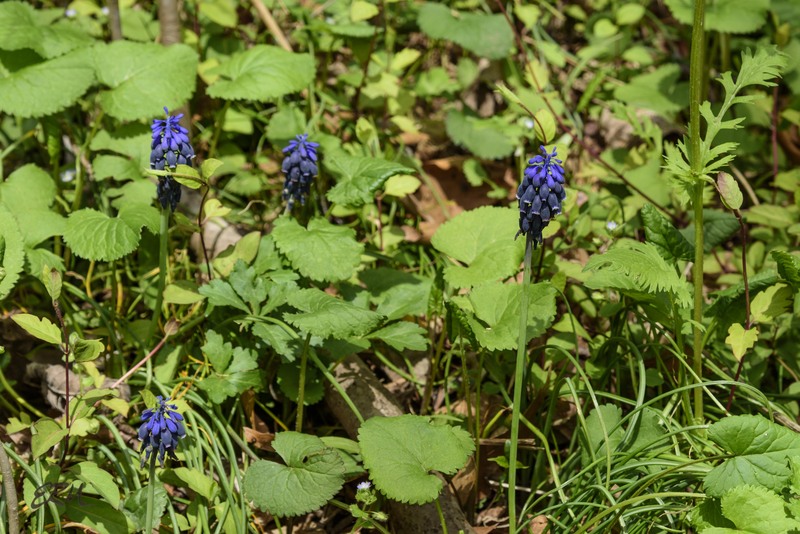 Every year I see this garden escapee along the Billy Goat C trail, and every year I think “yep – Muscari armeniacum“, because I know that plant from many years of gardening. But, I’m always fact-checking (or second-guessing) myself, so I looked up M. armeniacum, just to be sure. Imagine my surprise when multiple authorities show it present in North America, but nowhere near the Mid-Atlantic. 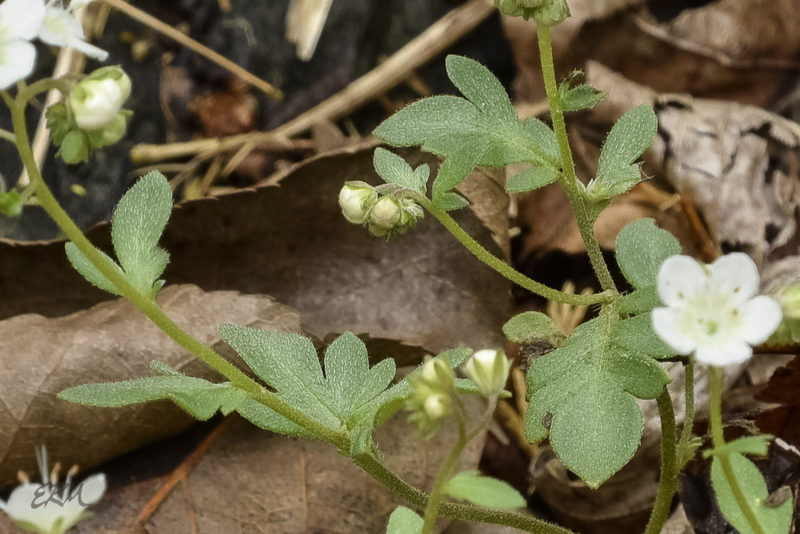 The same authorities show two other Muscari species, M. botryoides and M. neglectum, in the Maryland piedmont, so I checked Weakley’s Flora, and believe this to be M. neglectum. Unless it’s one of the cultivars. 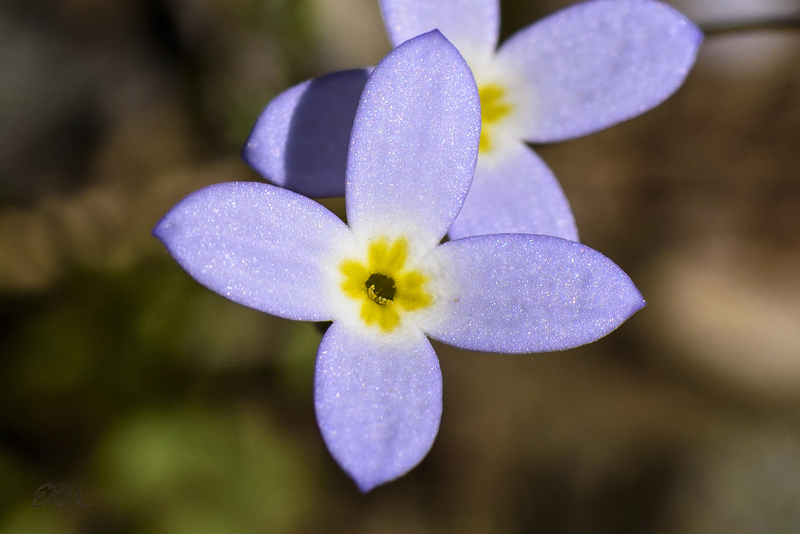 I think for the purposes of this blog, it’s good enough to say it’s a Muscari. There are numerous Muscari species and cultivars in the nursery trade, all of which go by variants of the common name grape hyacinth. Previously placed in the Liliaceae, they’re now listed in the Asparagaceae. 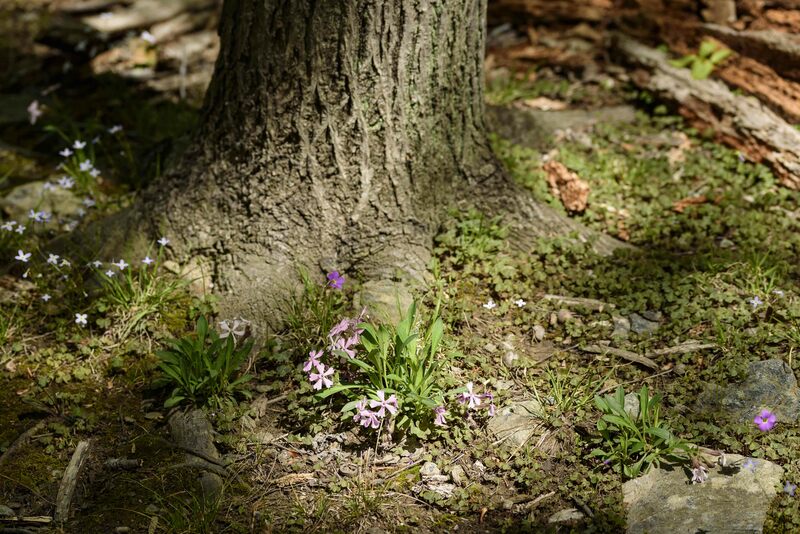 They’re easily grown bulb-forming perennials that bloom early and spread nicely in the garden, which is why they’re a problem: they naturalize a little too well. Populations of the various Muscari are now established in much of the US, excluding the Great Plains and the mountainous and desert regions of the West. I haven’t found any official listing of it as invasive other than in Tennessee, but that may be a matter of time. 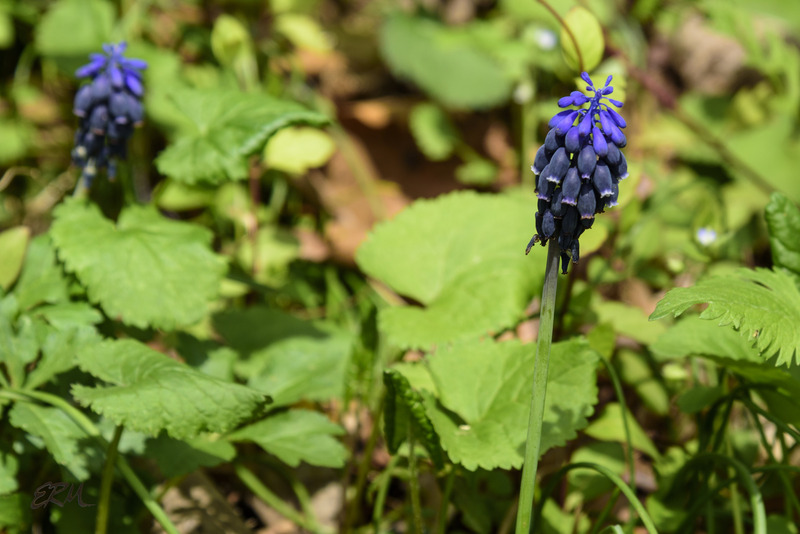 The long, grass-like leaves in these pictures belong to the grape hyacinth; it’s growing in a patch of golden ragwort, which has the heart-shaped leaves. When I finished shooting small-flower phacelia, I just sat and enjoyed the view for awhile, but then the sky darkened and rain looked imminent, so I got all the gear into my daypack and started hoofing it fast back to the car. And then I stopped short, because I saw this. I suppose a truly dedicated photographer and botanerd would take the time to set up the tripod and get decent close-up shots, but I hate getting wet, and more importantly I didn’t want the camera to get wet, so I took a few handheld shots and then really started hoofing it fast. This is Orobanche uniflora, known by the common names one-flower cancer root, one-flower broomrape, and ghost-pipe; it’s placed in its own family, the Orobanchaceae. 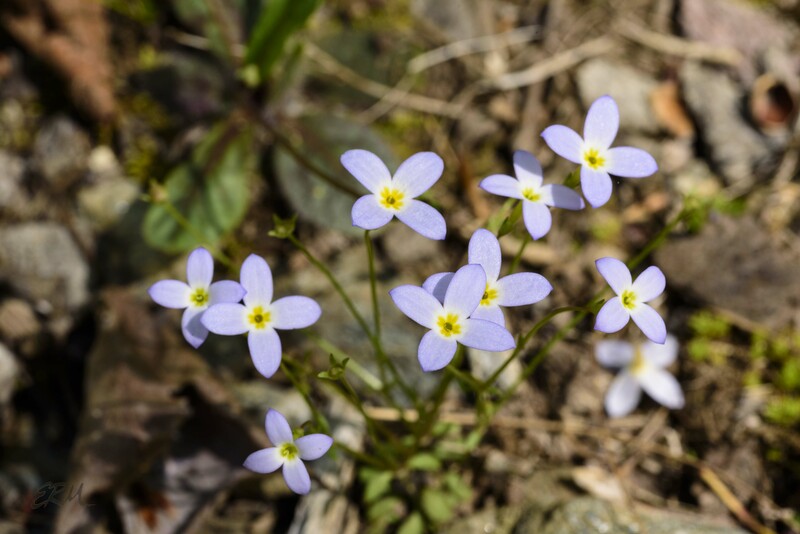 It can be found throughout the continental US and most of Canada, in moist woodlands and open areas, often growing right among species of Sedum or plants in the aster and saxifrage families*. 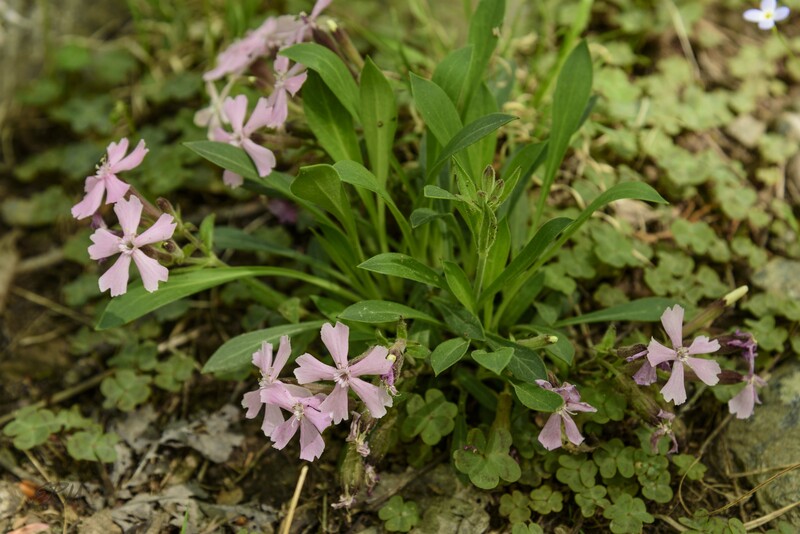 In Maryland it can be found from the Appalachian plateau to the western edge of the coastal plain. Notice that the stems are yellow, and there’s no green? That’s because this species has no chlorophyll: it’s parasitic, requiring a suitable host in order to germinate and grow. The leaves surrounding the flowers in these pictures are from other plants. Some of them look to me like one of the asters, though I can’t be sure unless I go back in a few months and see the plants blooming. 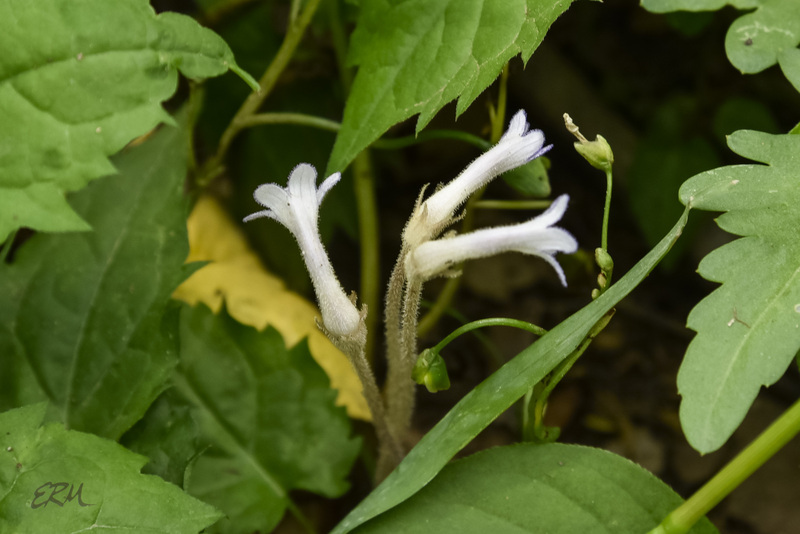 The various Orobanche species are on the federal noxious weed list, and are classified as noxious, prohibited, quarantine, or pest by eight states; Florida excepts O. uniflora, though. It’s hard to imagine this little thing causing significant crop damage, but apparently it can. Yet Another Phacelia. Last One For Awhile. Really. 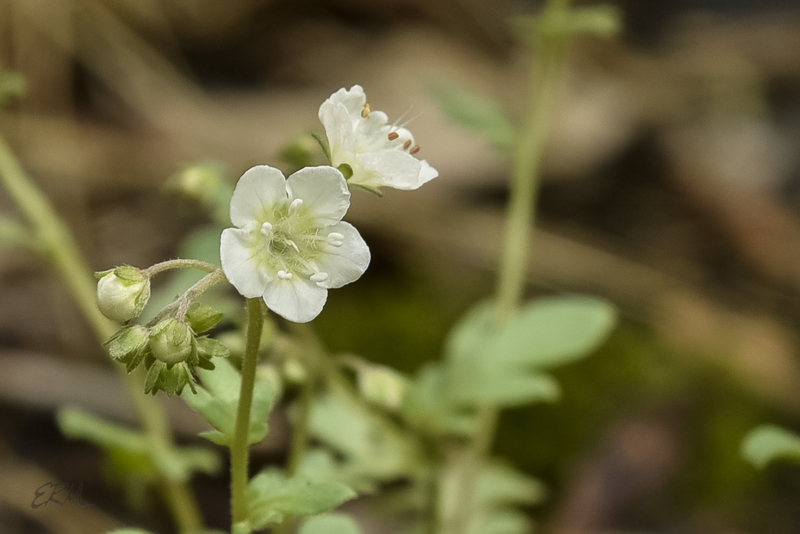 It was an overcast day, and I was working at my volunteer job downtown when I realized that rain was likely soon, and could continue for the next several days, and if I waited too long I’d miss seeing small flower phacelia blooming. Quel horreur! since this was a “new to me” species. 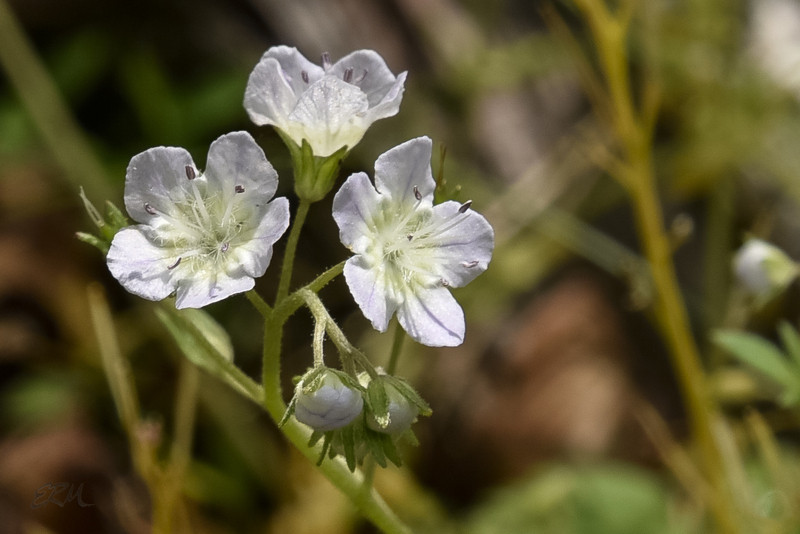 Phacelia dubia (smallflower phacelia, small-flower scorpionweed, Appalachian phacelia) is a short-growing annual forb in the Boraginaceae (currently). It’s found in parts of the Deep South but more frequently in the Mid-Atlantic states (Virginia, Maryland, West Virginia, Pennsylvania, and one part of New York). It’s presumed extirpated in Ohio. Like P. purshii, P. dubia is listed as S3/watchlist in Maryland. The two species are much alike, about the same height, flowers about the same size. Based on a one-time only observation in this large patch of plants, I’d say the cauline leaves of P. dubia are a little smaller, with fewer lobes, and mostly sessile rather than almost clasping as in P. purshii; also there seem to be fewer of them. Most of the flowers in this patch were white, though some of them had a blue-ish cast and a few were an outright light lavender. But color is seldom diagnostic. 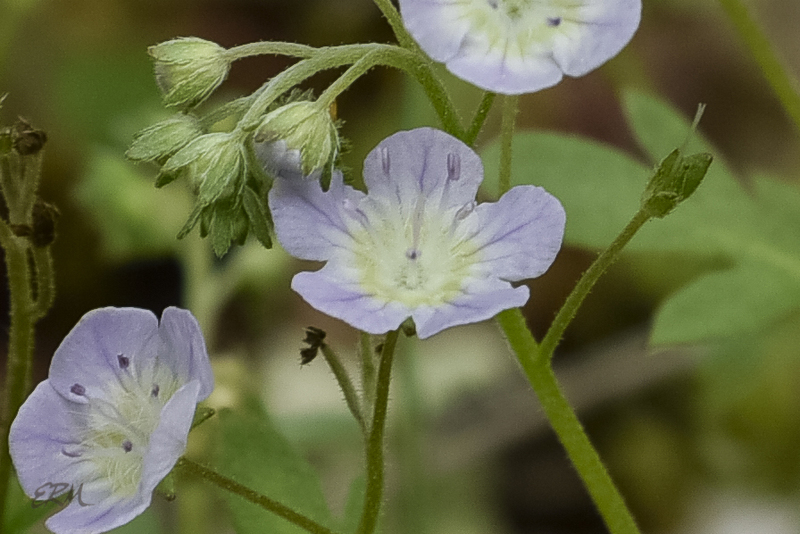 The obvious difference between small-flower and fringed phacelia is the fringed petals on the latter species. 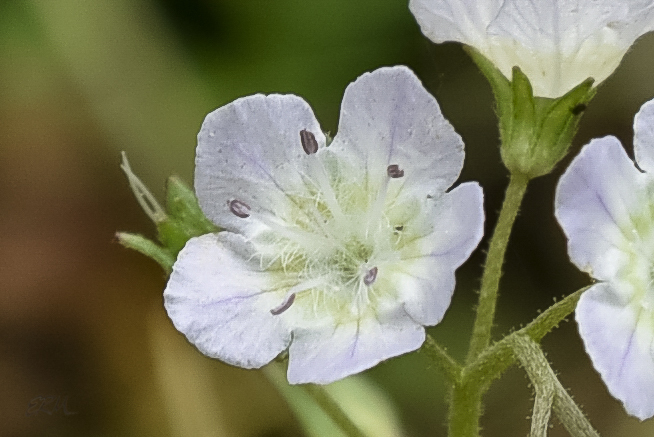 In small-flower phacelia, the petal margins are entire. Thanks for the tip, LW!